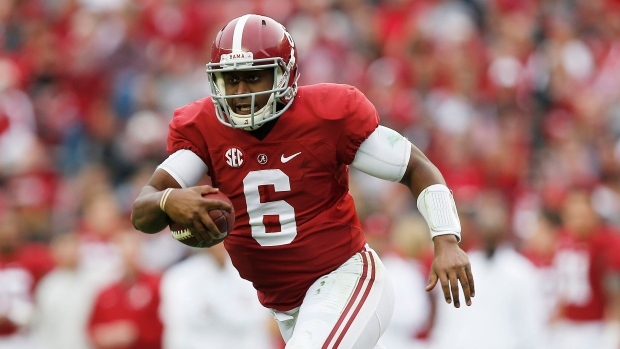 The Toronto Argonauts made a splash free agent signing, announcing Thursday they have signed former Alabama Crimson Tide quarterback Blake Sims. Sims threw for 3,487 yards and 28 touchdowns to 10 interceptions last year with the Tide. Sims added another 350 yards and seven touchdowns on the ground in leading Alabama to the inagural College Football Playoff, losing in the Sugar Bowl (semifinal) to the eventual champions, Ohio State. Sims went undrafted in the NFL Draft and after unsuccessful tryouts in Washington and Green Bay, landed up north with the Argos. Sims' workout with the Redskins was at running back.